Every child we design for and collaborate with is a child of perfect proportions – the ideal child. ~ Sharon and Peter Exley. Architecture Is Fun’s approach is imaginative, yet pragmatic in nature…they listen and are open to dialogue, problem-solve seemingly with ease, all while providing visionary ideas that will forge new ground for the museum field. Architecture Is Fun applies classical criteria to enlighten the design of family-oriented spaces. The Roman architect, Vitruvius advocated early cross-disciplinary study, prescribing that architects be educated and knowledgeable in everything from music to medicine and astronomy to philosophy. We advocate that design is a means of putting education into practice, architects must learn about the child, respecting her individuality, perspective, and abilities. We should utilize theories about multiple intelligences, play, and learning, and refer to the potential of educational pedagogies. We have translated this into a classical model that we represent with our Vitruvian Kid. 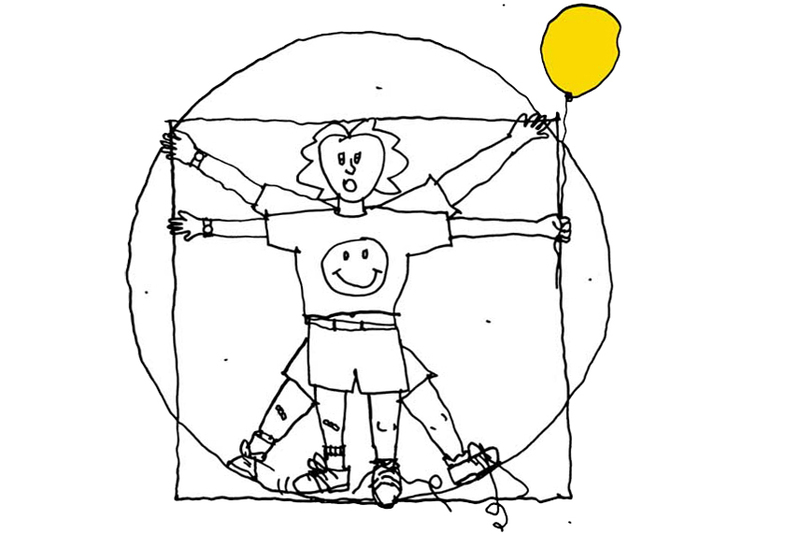 Vitruvian concepts influence us when designing for children of all ages and all abilities. Adapting Vitruvius’ “firmness, commodity, and delight” into “pragmatics, developmentals, and inspirationals,” we work within this balanced model. We create pedagogically-informed environments and experiences that fit all and form design that educates. That is our philosophy of Educative Design. When arranging the classical criteria in an educative and linear fashion, the pragmatics (schedule, access, code, budget, program, sustainability, etc.) and the inspirationals (exploration, interaction, wonder, awe, beauty) are the endpoints. The developmentals (age appropriateness, flexibility, ergonomics, etc.) hover in the center. Meandering through all three criteria, Architecture Is Fun creates environments that excel within the developmental and inspirational quotients, while quietly satisfying pragmatic non-negotiable requirements. Practicing educative design encourages the creation of non-linear experiences. ° Is sensitive to place and experience. ° Uses relevant iconography in elegant, evocative, and intelligent (rather than gratuitous) fashion. Use gratuitous iconography where it feels just right. ° Brings education and play together – play is a child’s vocation and preoccupation. ° Encourages design as expectation, rather than exception, beginning in childhood, setting the tone for a lifetime of awareness. ° Educates, referencing developmental, architectural, educational and inclusive pedagogical theories. The Vitruvian Kid is a service mark owned by Sharon and Peter Exley of Architecture Is Fun, Inc.
 Educative Design is a service mark owned by Sharon and Peter Exley of Architecture Is Fun, Inc.